Turns out they did translate 2 of them after all haha. Edit: Shout-outs to the people doing the live reports and live report threads. I find myself having to refer to those when I forget what happened in the games. How do you feel about making it to the Ro8? First of all, I feel so very good. I get to play a KeSPA player for the first time. For the Ro8, I get to face RorO hyung. I am very excited for that. You beat Genius 2:0 today. What was your secret for winning so easily? Our skills are similar but through expectations I was better. For the first game I purposely chose Cloud Kingdom. There is a build that Genius hyung always uses on this map. I had a feeling he was going to use that build on Cloud Kingdom so I prepared a build order to counter it. That's why I won easily. In game 2, both of you went for phoenixes. I won the phoenix battle during early game so I grabbed an advantage. I could've microed better as to not lose a single phoenix but I failed to do that so that was a shame. But afterwards, I felt like the game was already in my favor. You had some time to prepare for today's games. I like it when I have ample time to prepare for my opponent. The wait time I got for this round was the right amount. PvPs are more about thinking than practicing. I think I practiced about 5 games per map. You've made it to the Ro8. If you win three more times you will advance in to the finals. I'm confident. Through my games I think I am gaining back my old skills. My performances for the WCG and OSL qualifiers were not great. Recently I've been practicing really hard so I'm starting to feel it again. You will face RorO in the Ro8. I've watched all of RorO hyung's games and he's really god. He's definitely not an opponent I should underestimate. I'm going to see him as my equal as I practice. Things are a lot different than when you were with WeMade. In the BW days, I was in need of assistance from RorO hyung. But I started SC2 before he did, and since we are meeting in an official tournament, I want to win no matter what. I want to thank AcE, PartinG, and Avenge for helping me with practice. I want to thank our sponsors Red Bull, BenQ, ZOWIE Gear, and Joy Gear. Q: How does it feel making it to the round of 8 of the winner's bracket? A: The games were much harder than I expected, and that makes me even happier about being able to win. To be honest, I thought I'd have been able to win easily. Q: Why did you think it'd be easy for you to win? 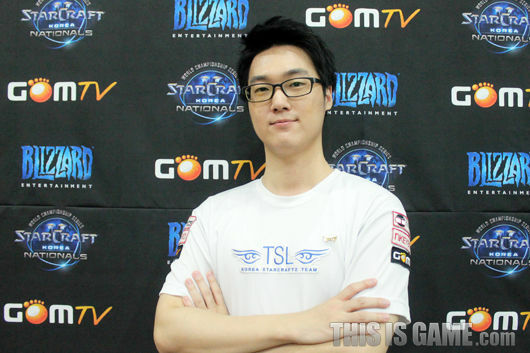 A: I am very confident in my TvP, and I thought the maps were pretty good. I feel that I wouldn't lose as long as the maps were balanced. I thought that I'd be able to win as easily as I did the first set, but my opponent prepared really well. Q: In the second game, your opponent managed to destroy your expansion. A: I didn't realise how many zealots he actually had. I thought it was a 3-gate, but realised I thought wrongly. I thought that he'd expand as well, but it turned out he was doing an all-in and managed to destroy the expansion. Q: Your opponent used a one-based immortal all-in in the third game. A: This is the first time I've seen this strategy, but I already had the feeling that something weird was going to come. I was never able to guess what strategy my opponent was going to use, but finally, after scouting, I chose to put down three bunkers. My opponent's attack was much stronger than I expected though, and I narrowly survived. Q: Your saving of the stims when defending your opponent's attack was impressive. A: I couldn't just use the stim randomly because my medivacs came out really late in the game. I only had one opportunity, but I wasn't able to find it because my opponent had his forcefields. Finally, in the last engagement, when he did not use his forcefields, I stimmed. A: I think so too, but I'm not sure what other people think. I seem to be winning most of my games recently. Hopefully this will continue for the month to come (laughs). Q: You came to the studio together with Stephano. A: He's sleeping well and eating well, and getting along quite well. I really want to have the chance to show him around Korea, but there hasn't been the opportunity to do so because we have to practise. It's really unfortunate. Q: You've faced Stephano quite a number of times in international competitions. A: It was quite awkward when I first met him, but it's ok now. When we practise together, the one who loses has to cook for the other. Fortunately we can speak a common language, and we got to know each other in quite a short period of time. Q: Your next opponent is either Seed or Gumiho. A: Both players are in really good form recently. The games are going to be really tough. I've not thought about who I'd prefer to advance and play against, but I have the feeling the no matter who advances the games are really going to be difficult. A: I want to thank Value and Inori for practising with me. I've got about a week of free time, and I plan to show Stephano around Korea. Those who know of good places where I can bring a tourist please let me know via twitter. Q: You've overcome the worst conditions and made it to the round of 8 of the winners' round. How does it feel? A: I didn't have the chance to practise or ladder for about a week, but as a result, it really put my mind at ease. I was playing with the mindset that it didn't matter even if I lost, and that actually turned out to be helpful for me. I just used the strategies which I typically use during practice for the games today. Q: You came to the studio straight after reaching the airport. How's your physical condition now? A: I'd feel really bad towards Gumiho if I said that I am in a really terrible physical condition. To be honest, it's not really that bad. My physical condition is just slightly worse than normal. I don't usually play well when I don't get enough sleep, but I was able to concentrate really well today. I was playing with a survival mentality. Q: You're back in Korea after winning the IPL TAC 3 in America. A: This is the first time I went overseas, and I suffered from jet lag. I had to fight not to sleep during the day when I was really sleepy, and at night my sleep time was delayed. It was quite tough. I got about 3-4 hours of sleep a day when I was there. The few days I was in America, I got about a grand total of about 20 hours of sleep. I didn't really sleep on the airplane as well. It's a mysterious feeling. It feels good to be able to help the team win the tournament. There were a lot of TeamLiquid fans there, probably because it was in the United States. Seeing so many fans of our opponents really terrified me a bit. The reactions were never really positive no matter what our team did, and it was just a little discouraging. Taeja was really playing very well, but I believed I could win on that map, and so I volunteered to play. I was also very confident in the mirror matchup against Hero. Q: On the whole, you played rather safely today. A: My condition today did not really allow me to overexert myself. I was trying my best to slow the games down, and I used the greedy strategy of getting a fast third. My opponent has a really aggressive style of play, and I felt that as long as I could hold two waves of his attacks I'd be fine. I made use of the information that was obtained in past preparations to prepare for today's games. Q: You weren't able to hold the first attack from your opponent in the first game. A: I was 100% sure my opponent would use a hellion drop, and I stationed three stalkers in my main, but I think I was still in dreamland at that time. I realised the three stalkers in my main were gone, and I had to work really hard to hold my main. And then I realised that the expansion which I just built was gone. At that point, I realised that I was in a quite a bad condition. At the next game, I drank some water and breathed deeply, and I started playing properly. Q: Your next opponent in the round of 8 is Polt. 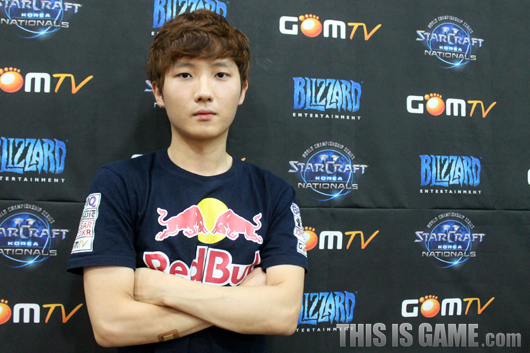 A: I think he and Taeja are both really strong Terrans, and the games are going to be really tough. However, for the match against him, I'll get the chance to have a lot of sleep and be able to play the games in my best condition. I'd be able to concentrate better, and I think there will be a better performance than the horrible first game today. Q: Do you have a lot of information about Polt? A: It's not really information, but I just studied about 3 replays of his. Even if I had a whole lot of information about him, he is a really strong player, and just information alone can't defeat him. His fundamentals are very strong, and I will have to prepare well. Q: After this, you just need three more wins to reach the finals. A: It's definitely impossible in today's state (laughs). It might be slightly possible after I get to eat and sleep properly. I don't really have very high expectations of myself though. I will play the following games with a relaxed mindset. Q: What did today's ceremony mean? A: I just wanted to express that I really wanted to sleep. I really want to sleep. I was so sleepy all throughout the game. I even thought about all-inning so I could sleep earlier. But from the final results, it's fortunate that I chose to play a more standard style. A: I want to thank the coach and the team mates who have been working really hard for the IPL TAC 3 finals. I think I'm quite awesome too, for going to America to play in the tournament with them (laughs). Based on Korean time, I played from dawn till morning. I want to thank my family and team mates who stayed up to watch the games and cheer for us. I also want to thank our sponsors, LG Electronics, Steel Series, Coca-Cola, Nvidia, and Googims. No Squirtle interview? =( Thanks for the Seed and polt interviews though. No, sorry Unless someone who knows Korean does it. Thanks for doing this. What happened to Storywriter though? Squirtle's interview coming right up! There were a lot of TeamLiquid fans there, probably because it was in the United States. Seeing so many fans of our opponents really terrified me a bit. The reactions were never really positive no matter what our team did, and it was just a little discouraging. poor seed, welcome to the liquid/foreigner bias! Come on that's normal. Watch any team-based sport, you'll see the foreign team is much less cheered on. And people know much more about every player in Liquid and the team itself than any player in IM that came, besides maybe Nestea. Probably taking a break before the next GSL starts or something I guess haha. That guy translates a lot of stuff in a short period of time. Seed's picture reminds me of that russell peters joke, "somebody gonna get a hurt real bad"
When Stephano practices with Polt, I fear for terran players worldwide. Also, Seed is a boss. 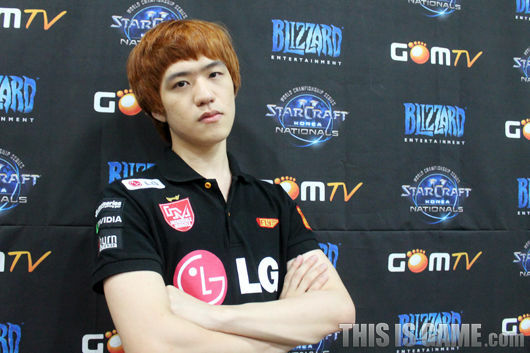 In this short time he came out of seemingly nowhere and not only won the GSL, he also proved that his win was no fluke by playing at TAC and defeating Gumiho in WCS.